TALLAHASSEE, Fla. (seminoles.com) – The Florida State Department of Athletics honored 22 outstanding student-athletes for the contributions they make on their playing fields, in the classroom and in the community at the 22nd Annual Golden Nole Banquet at the University Center Club. 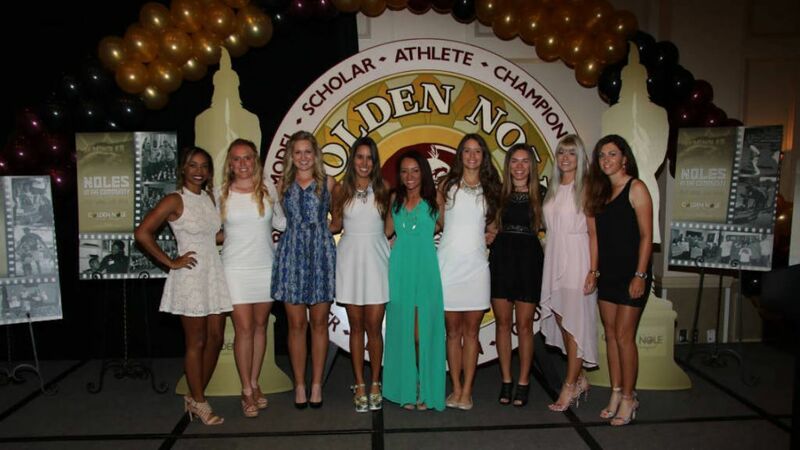 The Golden Nole Award is presented to the person on each athletic team who has exhibited the ideals of intercollegiate athletics. The honored student-athletes are selected by their head coaches on their athletic and academic success as well as their service contributions to the university and to the greater Tallahassee community. The women’s golf team was recognized for the 13th time in the last 15 years with the Director’s Cup for Service. The Director’s Cup is presented to the team that accumulates the highest average number of community service hours per team member. The women’s golf team averaged more than 26 hours of service for each of its 10 golfers. Nearly half of Florida State’s 20 teams averaged more than 20 community service hours per team member. The nearly 550 student-athletes that comprise the Seminoles’ 20 athletic teams combined to donate over 6,100 hours of community service to local communities and throughout the state of Florida. The 6,100 hours donated by the Seminole student-athletes is among the highest number of community service hours performed at Florida State in any one single year. Florida State’s excellence off of the playing fields has been matched by their performances on their chosen fields of play. The Seminoles are looking to earn their seventh consecutive top 15 finish in the NACDA Directors’ Cup for overall competitive success – a streak which began with fifth place finishes in both 2010 and 2012. Florida State is one of just four schools in the nation to finish in the top 12 of the Director’s Cup in each of the last six years.